Note that every mentor and mentee relationship is different. 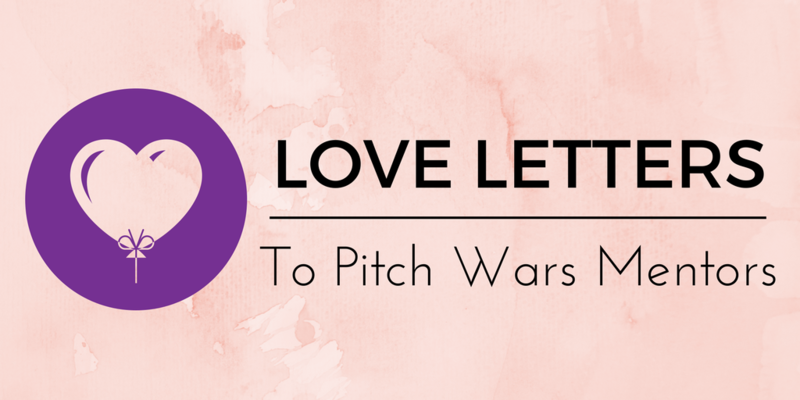 According to guidelines from the past, all that a Pitch Wars mentor is required to do is give their mentee an edit letter, and help with the entry for the contest. I hear there’s a new Pitch Wars website coming soon, and there may be new guidelines, so don’t take that as gospel. My point is that both of my mentors went way above and beyond the basic requirements. Their confidence in me as a writer keeps me going when the rejections get under my skin. The simple fact that they picked me from their slush piles was a huge confidence boost, but they also gushed about my manuscript, explained why they picked me, and gave me pep talks when I needed them. They understood the vision I had for my book, and collaborated with me to help the book reach that vision. When I wasn’t so sure about any one of their ideas, we discussed new ideas together. They both had edit letters ready to go quickly after the announcement of mentee picks, so I could take full advantage of the revision windows. This isn’t always possible for every mentor depending on life situation or behind-the-scenes changes. However, I loved that it worked out that way for me! They guided me through the YA contemporary market, recommending comp titles and dishing on their favorite reads in the genre. They helped me with multiple rounds of revision. Basically, each of them gave me a big edit letter, helped me brainstorm ideas for addressing the edits, and then read my revised version of the manuscript and gave me detailed line notes. They then read the manuscript a third time, focusing on trouble spots. This was above and beyond, and I can’t thank them enough for the time they spent helping me with these manuscripts. They pointed out patterns in my writing that I could improve on. For example, Rachel pointed out that I often had “talking heads” dialogue, where my characters were talking in a vacuum, and helped me figure out how to add action, interiority, and description to those scenes. Diana pointed out some examples of areas where I could trim to leave things to my readers’ imaginations. They pointed this out in their edit letters, provided a few examples, and then left me to go execute on these ideas throughout the entire manuscript. Rather than simply going in and fixing each trouble spot, they helped me learn—they taught me to fish. They communicated about their availability and timeline. I hit my deadlines, and they stuck to their timelines. They helped me figure out which agents to submit to and assisted as I navigated the querying process. I’ve kept them updated throughout my process, and they’ve kept me sane. Rachel and Diana are both great communicators, though they have very different styles. Rachel and I had a Skype call to discuss revisions. Remembering back, I was so nervous to chat with her! (Rachel, I know you are reading this—can you believe I was actually scared of you and now the bulk of our communication revolves around texting each other about our dogs?! (only a slight exaggeration)). Diana and I communicated mainly via novel-length emails, replete with Justin Timberlake videos and puns. I was a more seasoned Pitch Warrior by the time I worked with Diana, so I wasn’t as nervous as I was working with Rachel, though our relationship has certainly shifted from when it started, too. These days, Diana and I mainly discuss plans for our upcoming weddings (we are both a little terrified by all of the details involved! ), our lives as adjunct professors, and of course, still, Justin Timberlake. If you couldn’t tell from the last bullet point, I connected with both of my mentors on a personal level. This isn’t required, but I definitely kept that desire for a personal connection and friendship in mind as I chose which mentors to submit to, and I am thrilled that it worked out! Gosh, there is so much more that I could say about how much I loved working with Rachel and Diana! I am a very lucky, spoiled writer. “I wanted mentors who had experience writing in my genre, and who wouldn’t pull any punches when it came to critique. My mentors were a perfect blend of ‘we love this’ with ‘these things need to change.’ The timeline of Pitch Wars is similar to the timeline of working with an editor….so it helped me to get a feel for the pace of the editorial process that I could expect once my book sold. I hope this is helpful to Pitch Wars mentees and mentors alike. Good luck preparing for battle!